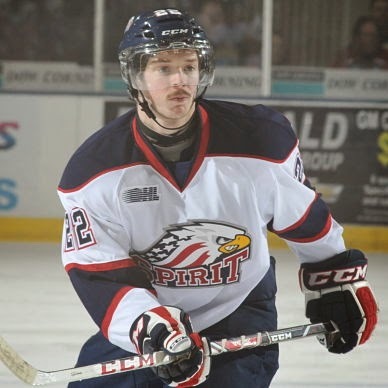 Somebody forgot to tell Jesse Graham (NYI 2012 6th) and his Saginaw Spirit that they would have done themselves a favor if they had lost to the Sault Ste Marie Greyhounds instead of beating them 4-3 in overtime on Monday evening. The Spirit with a loss would have been the 7th seed in the OHL's Western Conference playoffs and would have faced these same Greyhounds who are the 2nd seed in the Western Conference by virtual of winning the West Division but their reward for moving up in the standing will be a series against the Erie Otters. Jesse Graham had 2 secondary assists in this one including one of the game winning goal in overtime. For Graham, he finished his regular season with a 11-43-54 mark which was 3rd best among OHL defensemen including passing fellow Islander prospect Adam Pelech who also finished the season with 54 points but had 2 fewer goals. On Tuesday the Spirit will be heading to Toronto to attend services for their former teammate Terry Trafford and will then begin their playoff preparations against the Erie Otters. Sorry Spirit but it will be an upset if you guys are not swept as Erie finished the season with the 2nd best record in the OHL finishing just 2 points behind league leader Guelph. The Rangers announced on Monday that they had signed defenseman Ryan Graves (2013 4th) to an NHL Entry Level Contract. The contract was actually signed on Friday but the official announcement wasn't made until Monday but it was a contract that Graves clearly earned. 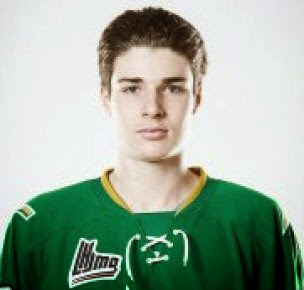 Graves is a 6'4 220 lb "stay at home" defenseman currently playing for the Val-d'Or Foreurs in the QMJHL and is coming off a career season split between Val-d"or and the Charlottetown Islanders. Graves was 5-17-22 with a +20 while playing the "2" role for the Foreurs. It is also the 2nd member of the Ranger's 2013 NHL Entry Draft class to be signed joining fellow QMJHLer Anthony Duclair. This is also a change for the Rangers who have started getting their draft picks under contract in their first year and so far it has been a good move by the team locking up the prospects so they can focus on their development rather than their contract next season. Graves is only 18 which means he will be spending next season in the QMJHL (no he is not even close to be talking NHL at this point in time). I expect Adam Tambellini to be the next one to be signed but his signing is going to be interesting to watch as unlike Duclair and Graves who were drafted as junior players thus unable to play in the AHL until they reach 20. Tambellini was drafted when he was intending to play for North Dakota in the NCAA, should he sign then he could by rule be allowed to join the AHL next season. Honestly though despite playing well for the Calgary Hitmen, Tambellini needs to fill out his body and in my book work on his defensive game. No question he can play offense but he is almost toothpick thin so let him spend another season in the WHL then bring him in.